Caring together: Georgia Harvey, Kyra McDonald, Saskia Hopp, Mia Hinson, Sami Hardy and Kayla-Rose Hennings showing off their paper skills during St Eugene College’s anti-bullying day. BULLIES seem to be thriving everywhere these days – in politics, in the media, in the workplace, online – but one place they are not is St Eugene’s College, Burpengary. Assistant principal for religious education Megan Kozak said the National Day of Action Against Bullying and Violence on March 15 was the perfect time to highlight the problem. “We know that bullying is a major issue around the country, only exacerbated by students’ constant connection with social media,” she said. Many of the St Eugene’s students were eager to add their voice to the campaign. “Bullying isn’t okay,” Year 2 student Eliza Porter said. For some of the older students, bullying took other forms. “In this day and age bullying is in the real world and online, so if we can stop it, it will make so many lives happier,” Year 12 student Hannah Sheather said. Each day of the college’s anti-bullying week it held an event. On Monday the Year 11s started with “Stop” Theatre, where students learned, through acting, what bullying was and how to prevent it. 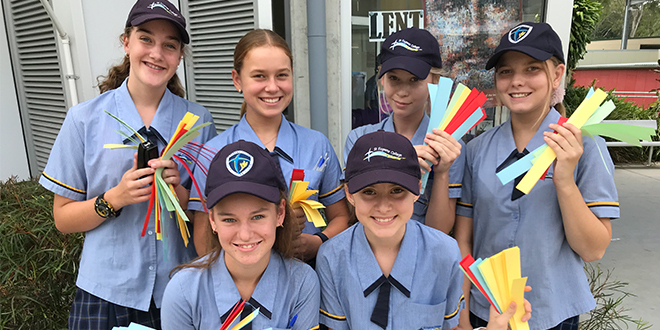 Tuesday saw the Year 9s run self-care corners, which placed the emphasis on the antidote to bullying – kindness – and that starts with being kind to yourself. Wednesday, the Year 10s created an Acts of Kindness wall in the library, where students shared their kind deeds. Thursday had the Year 8s work with students to create a giant paper chain of support, which stretched over 15m. On Friday, students and staff standing out in orange to stand up to bullying. The students who wore orange donated to Caritas’ Project Compassion appeal, raising almost $500. “You get to wear orange to show that you care about not bullying,” Year 3 student Ava Paledetto said. “By doing something different, it shows that we do actually care, not just that we say we care,” Year 12 student Declan Parker said. Guidance counsellor Bronwyn Wilkins said the college’s action against bullying was to reinforce how students could respond to themselves and others. “We have defined bullying and focused on how we respond as bystanders,” she said. “We also focused on kindness, as the antithesis of bullying; one can’t bully whilst being kind. “We believe that when we empower students with more ways to be kind (to others, to themselves and to the environment), this will increase the number of opportunities for joy to be experienced. THE school bell marking first break rang across Padua College, Kedron, and hundreds of schoolboys donned in brown-and-gold filed into Little Flower Church for their regular Friday Mass. Passing Franciscan Father John Boyd-Boland on their way in, the schoolboys offered waves and thumbs-ups to the familiar priest. The older students, who entered first, sat and waited reverently near the front. The younger students who followed brought a buzz of young chatter to the almost 50-year-old church. Fr Boyd-Boland asked the schoolboys who wanted to read the Prayers of the Faithful and who wanted to read the Scripture reading, which was met by eager faces coming forward. “We come together as a family,” Fr Boyd-Boland said. The Mass put a focus on the importance of kindness and humility, and away from the causes of bullying. “One of the great reasons why I love being at Padua College is it’s about you, it’s about us together, it’s about being a community of peace, healing, care and reconciliation,” Fr Boyd-Boland said. College formation vice-rector Michael O’Brien said the liturgy was given special promotion because it fell on “Bullying No Way” day. But it was also time for the schoolboys to give thanks for Fr Boyd-Boland, who only just finished a course of medical treatment. “It was an incredible sight to see a church full of young people who had given up half their lunch time to support our college stance on bullying as well as thanking Fr John for his presence in our community,” Mr O’Brien said. The Mass was the climax of a day of action against bullying at the college. Two videos on the college’s Facebook page showed both the primary and secondary students offering their pledge for National Day against Bullying and Violence. “I am a Paduan against bullying and I will speak up when I see bullying; reach out to others who are bullied; and be a friend whenever I see bullying,” the boys said in the pledge. Orange ribbons were worn across the campus and staff wore shirts to commemorate the day.